Thing to do is leave NOW, while the leaving is easy, and you have the time to set up a real place. There is presently a real place place there. You've got no place to go and all day to get there. Being cute, or just have nothing worthwhile to contribute to the conversation. I have much to do and many places to go for your information, but all day is virtually never an allowed allotment of time, but it should be in many cases. Aw, Jjr, you took JR's post in the wrong spirit: after an EMP. if it's as bad as they think it'll be, you won't have anywhere to go. The next place will be as chaotic as the one you're leaving. It'll be an EOTWAWKI situation. Getting the planting, haying and harvesting done will be the only time sensitive activities to worry about, and that's on a different time scale than most of us are forced to deal with now. Only getting my information from reading books like One Second After and others it seems to me the absolutely worse place to be in a situation like this is on the road. Not only roads clogged with stalled vehicles but many bandit type people out there also looking for an easy grab of food/water/ammo. I made the sacrifice (if you could call it that) of giving up the big paying job and living in the city more than 25 years ago to live simply in the boonies and never looked back. Everyone has different priorities - some feel the need to live in or around a city and have the big fancy house and multiple vehicles they can't afford. I walked away from that type of life many years ago. Now when a subject like this comes up I know what I am going to do without question - hunker down and try to survive with what I have worked toward all these years. Somewhat like "Star Trek" this is sorta going where no man has gone before, well there just does not seem to be any positive and absolute information known concerning how vehicles will react following an act of war (or terrorism) where an EMP, HEMP or NEMP is detonated over this country. Most authorities postulate that a powerful Solar Storm may wreck havoc with our electric grid, but vehicles will survive a Solar Storm without incident, however obtaining fuel may be difficult afterwards. Some authors theorize modern vehicles will react to such a detonation with nothing more than a "hick-up" at most and keep on trucking right along. Some promote diesels as being more resistant to such an event than gas burners. Others theorize only pre-electronic ignition vehicles will continue to function after such an event, and those vehicles are becoming few and far between. A few authorities (or so called authorities) even further suggest having a spare alternator, voltage regulator, coil, points, condenser, rotor, distributor cap, plugs and plug wires just as a precaution all stored in a Faraday Cage for a pre-electronic age vehicle. What are your contingency plans for transportation, if you have any, should this country be attacked with such a device. What equipment are you storing in Faraday Cages, if any, for use following such an event. This results will largely be dependent on what the evet was, how far you are from it, and what the weapon was that was used. If you want to plan for an war based emp, get a copy of MIL-STD-464 and check the appendix. This will give you the engineering design to requirements for design of aircraft and military equipment. Yes, commercial aircraft are designed to withstand an emp as long as they are not too close. Cars, trucks, personal electronics are not. Unfortunately, none of these types of transportation will benefit me getting from where I am to where I want to go. Bicycles & draft animals would be very desirable once there however. Hopefully, we will never experience such a cataclysmic experience, but it's better to be prepared than caught totally unaware. Bicycles are playing a big role in the Syrian refugee crisis. 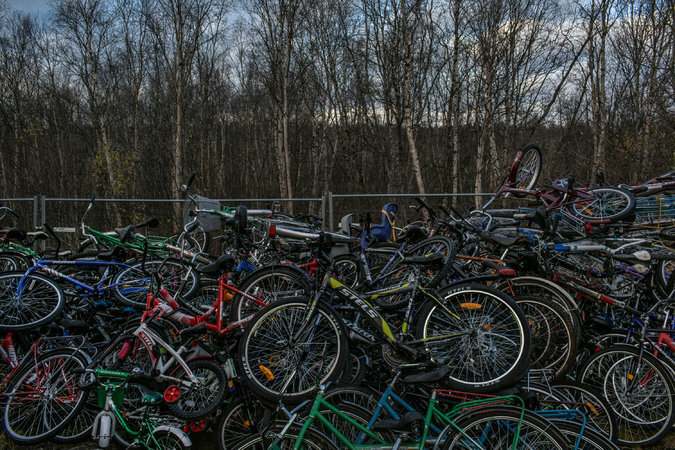 Apparently, the bikes are piling up at the border crossing. RE: Hoping it doesn't happen to us - history is littered with populations who didn't see it coming. A depressing google search about refugee trails and similar topics can be pretty revealing. I'm not neurotic about an EMP event, directed against us an act of war by another super power's military, but rather suspect an event would be more likely from a terrorist organization or rouge nation, with nothing to loose so to speak. Regardless of the source behind such an event, be it directly or covert, I believe it would be nothing short of an act of outright war. Although with a window of opportunity, who know what might happen at that time. The military theoretically have "hardened" their vehicles to withstand and EMP event, but it appears they are not completely sure the hardening will be totally successful, since there are reports the military stores whole engines in metal clamshell containers as a precaution against just such an even, but most individuals can not afford such an expense. Actually spare wiring harness systems and other electrical components stored in metal clamshell cases would be much easier to replace and faster to replace and get vehicles rolling again than replacing the whole engine, if what we have been lead to believe about the effects of an EMP are basically factual. But there are so few know facts and so many more unknowns to factor in concerning an EMP, it's hard to separate facts from fiction (ideas/beliefs/hypothesis/etc). In some places the veneer of civilization will probably disappear rapidly, but not so quickly in others. I never had one of those high paying jobs you mention, but when we moved here 39 years ago it was fairly rural and not even considered a bedroom community to the larger metro area just up the road. My commute was over 50 miles round trip each day. The metro area has grown in different direction over those past nearly 40 years now, but with an interstate and four lane divided US Highway coming our way the growth shift has largely been in our direction. We are now a bedroom community to the metro area, with people moving here to get away from the gangs and other undesirable features of the metro area. Add to that the fact we have been one of the fastest growing small towns in the state for a number of years now and the very fastest growing area the past three years running, we are no longer a rural area. Twenty-five years ago we had the second largest number of dairies in the state. Those dairies are virtually all gone (three or four exceptions are still holding on) and the majority of those dairies pasture lands contain more homes now than dairy cattle previously grazed there. Anyone with more than an acre has someone wanting to buy it and build a subdivision or home there, be it timberland, farm land, even a swamp (they'll even build it up and build on a swamp too). Jjr - what you explain is kind of what happened to me in my younger years. I was born and raised in New Jersey which was really quite rural way back then. But then the suburban sprawl started which I saw coming so moved a little west into the Pocono Mountains in eastern Pennsylvania. Back then a beautiful very rural area. But then the sprawl continued reaching out and the Poconos became more of a suburb or NYC and NJ. Housing developments everywhere along with the stores and city attitudes. So then came one more westward movement some 25 years ago to the most rural part of PA that I could find. Luckily the sprawl from any of the cities (NJ, Philadelpia, Pittsburgh) has never got this far and stays as rural as it was when I first moved here. In fact I think I read where our county population has been declining steadily over the last 10 years. There is nothing here as far as work or entertainment which keeps the people away. Quite true doc. Those who survive the initial consequences of an EMP event will be busy with seasonal activities, but the majority of the younger population do not have a clue as to what would be required for any long term survival at that time. Pillage and plunder is suspected to be the order of the day for most and especially those living in larger metropolitan areas. Those close to and around the major metro areas are likely to be targets of the pillage & plunder crowd. Even if the general population conducts itself with greater civility than most seen to expect, it will not be a pretty nor easy future for anyone, in the immediate aftermath of such an event, if the effects are anything like predicted. You all been reading to many " novels"
I typically find myself arguing with the authors -- it seems that EMP is very convenient for creating a "sudden" TEOTWAWKI. According to the story, it took nearly a month to repair the damage at the sub station and during that time, power had to be re-routed. It's not a far stretch to think that with a bit of intelligence and organization a committed group of a few dozens of shooters could cause a cascading failure of the grid. It wouldn't debilitate vehicles but it would be traumatic to the society. That's enough to convince me to be ready for something happening to the grid. I plan mostly for that - being without electricity for an extended period. Our power goes off for short periods of time a couple times a month - sometimes for 4-6 hours. Even without any kind of major attack I feel our grid is very vulnerable. Snakes I see do not bother me very much. It's the ones I don't see which I fear. And........., if we believe the official record, how may incidents have been averted to date because the authorities have thus far been able to apprehend the cells or individuals planning the activities prior to their plans execution. The ones which the authorities may miss are the one's that also worry me. Tell us how many ? You're entitled to be skeptical if you prefer....but just remember, nobody believed Noah either. In testimony before congress, Sean Joyce, FBI Deputy Director revealed surveillance programs have disrupted more than 50 potential terrorist events, including at least 10 plots based inside the U.S. Four of those cases have been made public. From a Washington Post news article by Ruth Tam dated June 18, 2013. Since two years have passed since that article was written, those numbers have probably increased. If you want to plan for an war based emp, get a copy of MIL-STD-464 and check the appendix. This will give you the engineering design to requirements for design of aircraft and military equipment. I have a copy of a Mil-STD-464 Field Manual in hand as of this morning. A friend who owns an Army Navy Surplus Store happened to have one. Reading and studying it, following supper each night, is the next order of business. Thanks again for the thumbs-up!